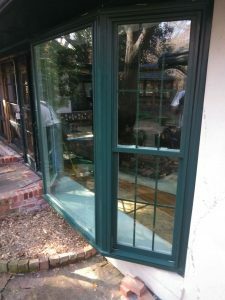 The Window Source Atlanta replaced the windows in this upscale home in the Buckhead community of Atlanta, GA. Our windows come in a variety of colors and this homeowner wanted to keep the original green window color. Our crews installed 5 Bay windows and over 25 double-hung windows on this home. We started with just a few windows to build trust with the customer that the services we offer will exceed her expectations. The home owner was pleased with the work performed and continued using The Window Source Atlanta to replace the rest of her windows. Here is what she had to say! Customer Review: I have a 1940s house in the “high rent” district of Atlanta. The house has a second floor that was added in the 1970s with Andersen windows, which I would never buy–their cranks were all broken and they leaked air and energy like a sieve and even admitted stink bugs–terrible. Basically all of the windows (1940s, 1970s, and 1990s areas) needed to be replaced. I researched and got multiple bids for no maintenance, energy efficient, UV block windows. I discovered this company and got a bid, which beat out the competitors and had a warranty for the life of the structure–cannot beat that. My only concern was whether this unknown company would give good service for my old house and whether the products would fit right and look good. I started with 4 casements on second floor and was satisfied. The first installation team did not clean up after themselves and left some marks, but the company gave me touch up paint, which solved the problem. I told them that I wanted the “A” team if we were to do more work together. They promised and delivered an excellent team of installers for the bays that I then ordered for upstairs. At no additional charge I got copper roofs for the custom ordered bay windows (fabulous look), which added a wonderful touch to the rooms as they look out onto the patio and garden. Feeling less terrified to take on my living room and dining room, both with unique and fragile antiques, rugs, and artwork, we took on the first floor, installing 8 fixed picture windows, 4 in LR and 4 in DR, since I had never opened the prior casements in those rooms. To my delight, the installers were very polite, moved the furniture and rugs, laid down drop cloths, created no damage on installation, and cleaned up after themselves. Emboldened, I addressed the older areas that really needed new windows and French doors. We installed three bay windows in the 1940s family and breakfast rooms. A different team came out, again polite and willing to move furniture, etc. They discovered unexpected wood rot at the bottom of the old doors due to decades of water damage, so there was an additional charge to cut out and install new wood there; this was fair. 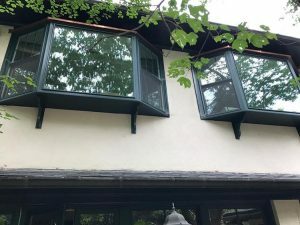 I had them install 3 more fixed picture casement style windows in the breakfast room that we had added in the 1990s when we remodeled the kitchen; the old picture windows were glass with wood and featured wood rot, but the new ones cured this problem, no additional charge. I found the company to be easy to work with. Perhaps they have learned from past mistakes. They were service-driven, and only provide ZERO maintenance, energy efficient windows, which they and the manufacturer stand by. I added the screens and the UV block 95% to protect people, furniture, and fabrics from the damages of UV; I had previously experienced such damages in the living room to the damask silk and a handmade table, who had to be refinished. You can get half-window screens if you want to open the windows for fresh air. These screens are unobtrusive. The windows open and close smoothly, and the paint finishes are baked in. They open different ways permitting you easily to clean them outside and inside. I ordered white for the interiors, while the exteriors were a dark green that blended satisfactorily with my existing exterior trim. At no additional charge the company installed dark green aluminum strips on the outside to conceal the spaces that revealed white between the windows, so I would not have to hire a painter to do this. The French door arrived white on the outside and inside so there was an additional charge to paint the exterior (this was in the bid), but the company added attractive doorknobs at no additional charge. 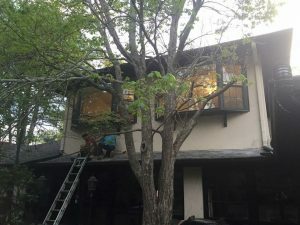 The last installers routinely worked until dark to get the job done right, never complained, and communicated with me each step of the way, especially when they encountered problems, like the wood rot that added time to the job. I have found commitment to do a job right to be rare, but this company takes pride in its work and has reliable, skilled workers installing the product and cleaning up afterward. The one thing you will need to understand, however, is that precise measurements are taken and each order is custom made. Especially in the case of my bay windows, which the company apparently had never installed before, we had to wait longer than the company and I had anticipated, but I knew that the company was not to blame, and the manufacturer, frankly, was doing an excellent job making a beautiful, durable product to precise measurement. Do not be upset if there is a delay in your order; build in expectation time and you will get an excellent product at excellent value. The other bids for the same type of windows were considerably more expensive, which gave me insight on how much windows can be marked up in this industry. I would not hesitate to recommend this company and plan to recommend it to my neighbors in our Nextdoor website.